The U.S. October 2012 monthly trade deficit increased by 4.9%, $1.963 billion to $42.24 billion. The trade deficit with China hit an all time monthly record of -$29.466 billion. Remember all of those promises during campaign 2008 to finally reform trade and stop NAFTA like trade agreements? Chalk up another one to the win elections rhetoric dust heap. While Obama claims this NAFTA style Bush era trade agreement is the very ole and tired corporate-speak win-win, odds are it's another lose-lose. A loss for the American people and a loss for Obama himself in 2012. Obama has announced a new trade agreement with South Korea. There is just one new tweak that is better than before, the tariff schedule on autos. Merely tweaking the “cars and cows” market access provisions of Bush’s NAFTA-style Korea trade pact but leaving in place the offshoring-promoting foreign investor protections is a slap in the face to the majority of Americans who, according to repeated polls, oppose the same old trade policy that has cost millions of American jobs. Some good news for U.S. workers. Obama's negotiations with South Korea for yet another NAFTA styled trade agreement failed. There will be no new trade agreement. This one was a battle of the businesses, the labor arbitrage loving statistical spin machine U.S. Chamber of Commerce against U.S. auto makers Ford and Chrysler. President Barack Obama won’t be returning from his Asia trip with a renegotiated free trade agreement between the U.S. and South Korea. Concerns over barriers to American automakers selling more vehicles in that country remain a point of contention. The Obama administration had hoped to reach a deal on the free trade agreement first settled in 2007. That deal was never formally approved by either nation, and congressional Democrats – particularly those in the House – had balked because of concerns that U.S. automakers still couldn’t compete on equal footing in South Korea. This week, Chrysler Group LLC joined Ford in opposing the deal as written. Last week, Ford took out a full-page ad claiming that for every 52 Korean cars sold in the U.S. only one American car is sold in South Korea. Of course the Obama administration is pledging to keep at it, but the House, including the new Republicans might have some different ideas. In a joint statement, current House Ways and Means Chairman Sander Levin, a Royal Oak Democrat, and his presumptive replacement, Republican Dave Camp of Midland, said “Further negotiations will succeed only if South Korea adopts concrete steps to open its market to U.S. exports” including autos. 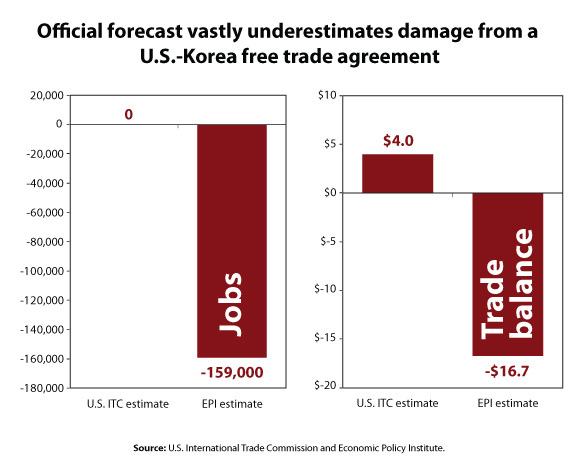 Economist Robert E. Scott has cranked the numbers on U.S. job losses if the South Korean Free Trade Agreement is passed. Yet another bad trade deal would cause 159,000 Americans to lose their jobs over 7 years. EPI’s research shows it will increase the U.S. trade deficit with Korea by about $16.7 billion, and displace about 159,000 American jobs within the first seven years after it takes effect. Forbes is reporting that Russia, Romania and South Korea were downgraded in sovereign ratings, Romainia to junk. Fitch lowered South Africa's ratings outlook as part of a wider review of 17 major investment-grade emerging economies that also resulted in Romania's sovereign ratings downgrade to 'junk' status and ratings cut for Bulgaria, Hungary and Kazakhstan. Bloomberg notes a sudden spike in insuring Russia's debt and the Ruble is devalued.